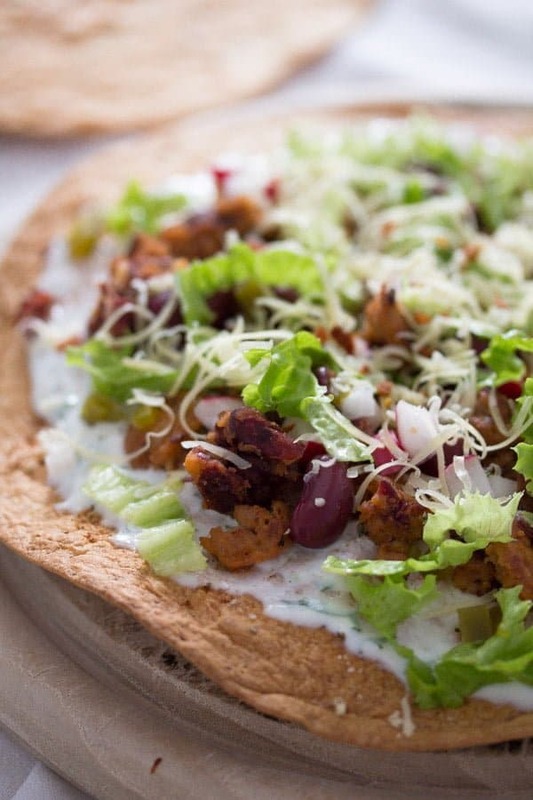 Amazing Mexican tostadas with chorizo, kidney beans and cheese. With instructions on how to bake tostada shells. I liked or loved everything I cooked during this series dedicated to food from the countries participating to the FIFA World Cup. A few of my favorites were, for instance, the Okonomiyaki or the Choripan con Chimichurri. But these Tostadas with Chorizo and Beans and the Korean Chicken Wings (recipe coming soon) were my absolute favorites. Well, I didn’t really know it myself until not long ago. Mexican food is great, everything I have ever tried was fantastic, but truth is, that I have never really tried many Mexican recipes. The reason is that Mexican food is not particularly known in Germany, maybe more in the big cities, but definitely not here where I live. There is not one Mexican restaurant in a range of 100 or 200 km around here, the only one I have ever entered was one in Frankfurt a couple of years ago. I had a burrito with chicken, I remember that, but I cannot say that I found it particularly good, it was OK but not more than that. So, the only good but probably no so authentic Mexican food I have ever had was at home. The usual, what everybody knows around here: chili con carne, tortillas with different fillings and guacamole. But, more recently I have started to experiment more with Mexican recipes and I loved every one of them. Especially these Tostadas with Chorizo and Beans! Tostadas are very popular in Mexico and probably the US as well. Tostada means “toasted” and refers to a tortilla that is deep fried or toasted or to a dish where different ingredients are piled on a toasted tortilla. To make tostadas was originally seen as a way of using stale tortillas, which would be too old to be used for tacos. The tortillas usually used to make tostadas are corn tortillas, but wheat tortillas can be used instead. Of course, I had to use wheat tortilla, I have never even seen a corn tortilla around here… But corn or not, my wheat tortilla tostadas were beyond good. Really, you have to try them! OK, I could not really convince the kids with the combination of chorizo and crushed kidney beans (they loath beans, both of them), but for me and my husband these tostadas were just amazing. 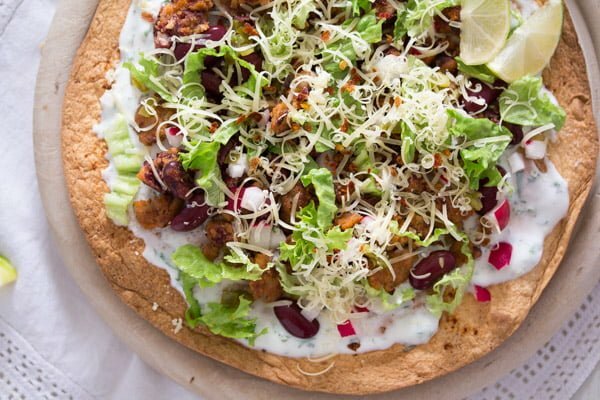 The combination of that spicy and hearty chorizo, mixed with the soft, crushed beans, the super crispy tostada shell and the crunchy fresh ingredients on top and then the cheese… it can hardly get any better. One of my favorite quick meal discoveries this year. 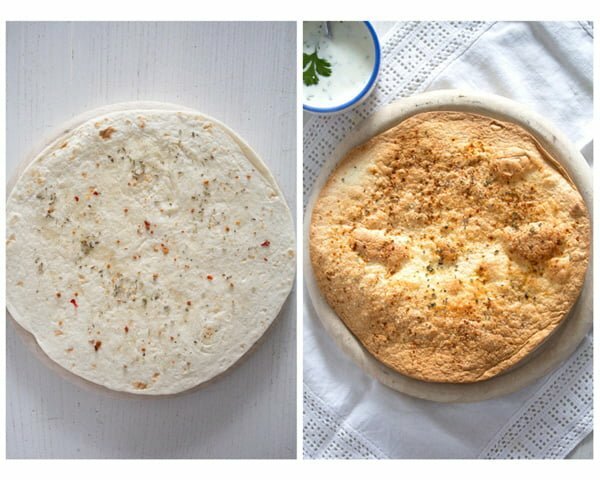 How to bake tostada shells? That was what worried me the most at first. I have read about tostadas and, looking at the pictures, I’ve always noticed that the tortillas looked rather stiff. I had made tostadas only once before, but in that recipe the tortillas remained as they were and that is soft. I had just placed them on the baking tray, topped them with the rest of the ingredients and put them in the oven. Delicious, but not the way I wanted to make them now. So, how to get those tortillas crispy, I imagined that people were able to buy them in that crispy state and almost gave up on the recipe. And then I found a way to make the tostada shells at home. So easy! Just brush the tortillas with a little oil, salt them and add more spices if you want, and bake them for quite a short time until nicely browned and crispy. Perfection! They were even superb on their own, without any topping at all, just the spices. I’ve made a bit too many the first time, because the first batch came out darker than I had wish for and we broke those tortilla to pieces, made guacamole and ate the crispy tostada pieces with guacamole the next day. You can eat the tostadas immediately or you can store them for later use in an airtight container at room temperature. They will keep for up to 3 days. You can also freeze them for up to 3 months. When ready to serve, let thaw and heat them up at 200 degrees Celsius/ 400 degrees Fahrenheit. After you baked your tostada shells, use your imagination and top the tostadas with whatever you like. 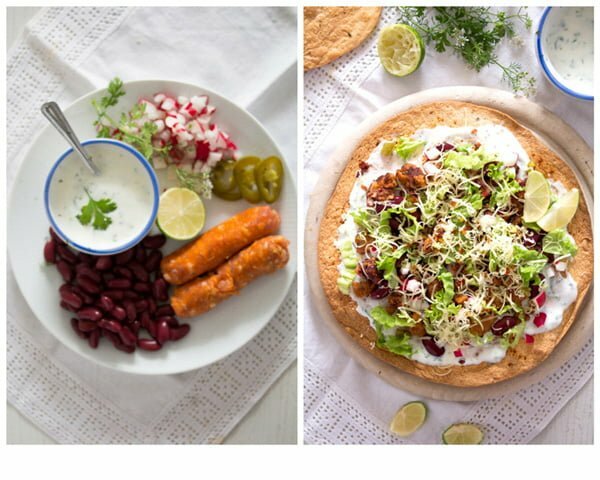 I topped the tostadas with some spicy Greek yogurt, a mixture of chorizo and crushed kidney beans, radishes, salad and grated cheese. And not to forget the jalapeňos, they’ve made the whole thing really spicy!!! Otherwise, there are dozens of things you could top your tostadas with. 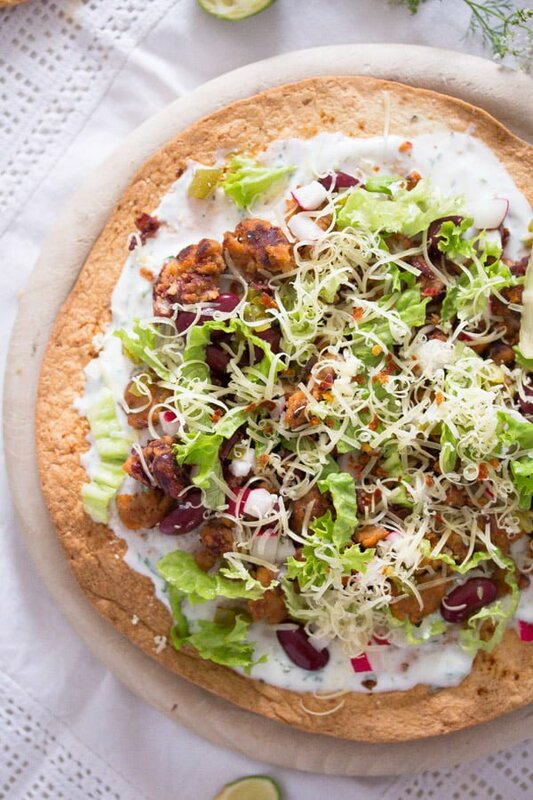 Start with some yogurt or sour cream preferably mixed with some spices like ground cumin, ground coriander and chili. You could add some herbs as well. Then go on with beans, refried beans for instance. 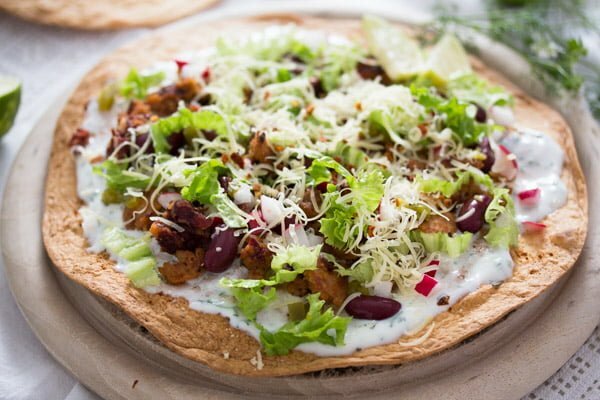 You could leave the tostadas vegetarian and after adding the beans, you could add some shredded crispy salad, some diced radishes or tomatoes, avocado pieces, sauteed peppers and zucchini or other fresh or sauteed vegetables you like. 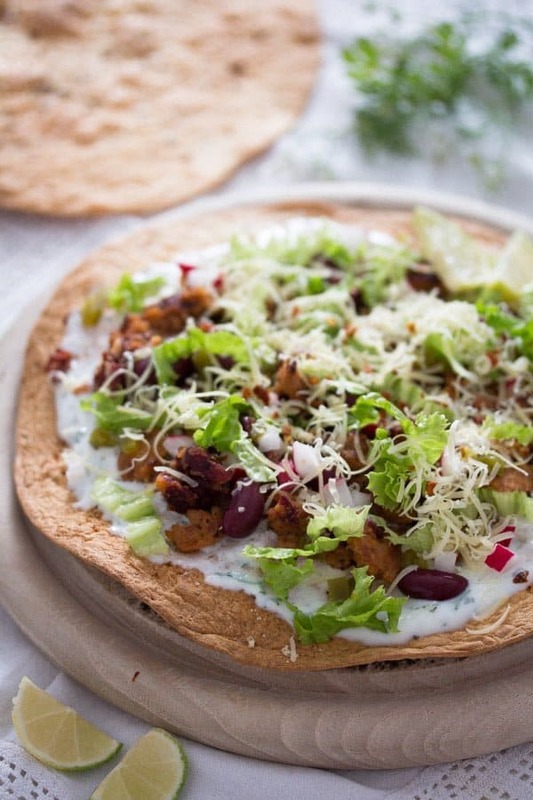 If you would like to add some protein, chicken tostadas are just amazing! 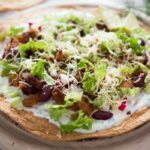 Ground beef makes a delicious tostada as well and although I have never tried that, I am sure that some nice sliced steak pieces would be very tasty as well. What I did try and liked just as much as today’s Tostadas with Chorizo and Beans were tostadas with an egg on top. In my case, I prefer a poached egg, but my husband loves to top his tostada with a fried egg. A bit of spicy salsa on top would be the perfect closure! Preheat the oven to 200 degrees Celsius/ 400 degrees Fahrenheit. Line two baking trays with baking paper. Place the tortillas on the baking trays. Brush them with olive oil and sprinkle them with salt, chili flakes and dried oregano. Bake the tortillas for 4 minutes. Turn over and bake for about 3 minutes more or until crisp and lightly browned. Remove from the oven. See above for tips on storing the tostada shells. Stir the yogurt with salt and fresh herbs. Wash and dry the lime. Zest it and give the zest to the yogurt. Halve the lime and squeeze the juice out of 1 half of the lime. Add it to the yogurt and stir well. Set aside. Keep the other half of the lime for later, cut it in wedges and serve the wedges with the tostadas. Remove the chorizo casings. Heat a non stick pan and add the sausages, breaking them into pieces with a wooden spoon. Fry over medium-low heat for about 3 minutes, breaking all the lumps with the wooden spoon. Add the kidney beans and some salt. Use a potato masher to roughly mash the chorizo and bean mixture. Cook until cooked through and rather crispy, about 7 minutes or so. Adjust the taste with more salt and some pepper, if necessary. While the sausages are cooking, shred the salad leaves, finely dice the radishes and finely chop the jalapeňos. Grate the cheese. Spread some of the yogurt mixture on top of the tostadas. Divide the chorizo and bean mixture between the tostadas. Top with the shredded salad, radishes, jalapeňos and sprinkle with the cheese and chili flakes. Note 1: The tortillas I used had a diameter of ca 22 cm/ 8.6 inches, but you can use smaller ones, if available, and make more tostadas) Note 2: I had wheat tortillas, but corn tortillas can be used instead. Note 3: I used Gouda, but you can use another kind of cheese, if you like. You could use Mexican cheese, if available. Sometimes I love tostadas more than tacos. These look delicious! Interesting use of kidney beans. I’ve used pintos and black beans on tostadas, but never kidney beans. I can see them pairing with the chorizo quite nicely. I’m loving your world series of food. Your tostadas look awesome. I like your baked version instead of deep-fried. i love tostadas! i feel like they’re often overloaded with fatty things, but yours are fresh and delicious!